The best balance walker updated with a soft padded seat! This fun, engaging design provides support for children as young as 9 months to build strength and confidence to start walking on their own. 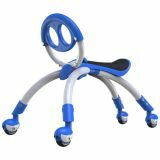 Multi-directional ride-on for up to 3 years, it teaches balance, coordination and space awareness. Max weight of 44 lbs. Ages 9-36 months.